Yea... you can tell my story. We traveled with our friend, Deb, before dual voltage appliances were as available as they are today. 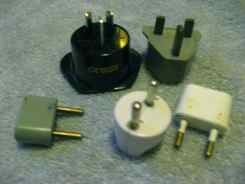 …because all you need is the correct adaptor plug (or plugs) for the country that you are going to visit. What does dual voltage appliance mean? Elsewhere, we give you a little more information on electricity worldwide if you want that too. Here what we're talking about are appliances and electronic devices that are designed to operate on voltage anywhere between 110 and 240 volts without damage. The U.S. uses 110 volts. Europe and much of the rest of the world uses 240 volts. If you do NOT have a dual voltage appliance, and if you use that device with the wrong current… it will either not work properly… or it might burn out! Does that mean you can use them anywhere? …And the beauty of it is they eliminate the need for voltage converters or transformers. How do you know if you have a dual voltage appliance? Look on the back, or the bottom, or the handle…. 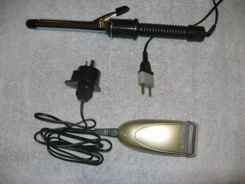 My curling iron, for instance, is stamped on the handle 120V/240V telling me it's OK to use anywhere. But the box said it was when he bought this new one, and it is described as dual voltage in the "Instructions and Care" booklet that came with it. Some accommodate automatically... my curling iron does. On other appliances you may need to flip a switch. Mark needed to change the setting on his old razor. His new one also accommodates automatically. Either way, you won't need that transformer/converter but you may still need an adapter so the plug will fit the electrical outlet in the country you're visiting. If you need to change the settings on yours, you might want to change that setting as you pack so you don't forget to change it once you arrive. 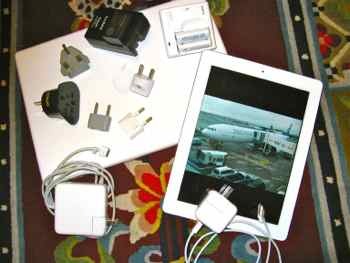 Most modern electronic equipment like laptops, iPads, and camera battery chargers are multi-voltage, meaning they will operate on voltages ranging from 110-240 volts. So you will be OK with just an adaptor so they'll fit into the socket... You can go ahead and charge your computers, tablets, cameras, and camera batteries and phones. Not all plugs are created equal either! Your U.S. plug will not fit into a European electrical outlet or socket. It works the other way too… European plugs need an adapter to fit U.S. electrical outlets. We carry a collection of adaptor plugs, but when we got to Australia, we had to find a store that sold electronics so we could get an adaptor that worked there. So don't worry... even if you don't have the right adaptor before you travel, you can always get one there. My old curling iron was NOT dual voltage. I used to plug it in and unplug it in short intervals as I used it. That wasn't optimal, but it worked. She didn't burn up her curling iron, but you should have seen how she fried her hair.... and it was in the FRONT!!!! It took her weeks to grow it out. The good news is we're still good friends, and we laugh about that story often. The moral to that story is get an appliance with dual voltage or use a voltage converter! Look for dual voltage appliances when you're preparing for your trip. 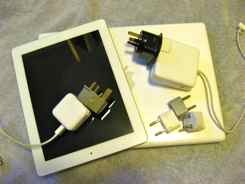 That way you won't have to buy and pack a converter or transformer.... just pack your adaptors and you'll be ready electronically anywhere in the world.